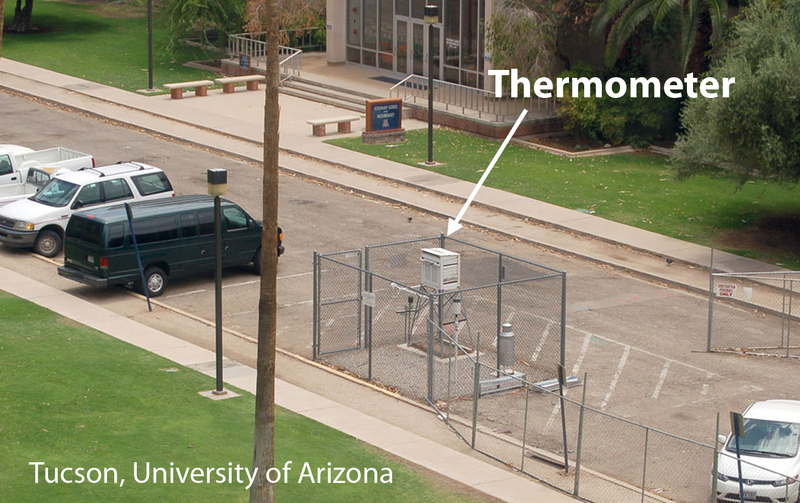 Would you trust data from sensitive thermometers in parking lots surrounded by concrete, beside busy roads and within meters of air conditioning outlets? NASA does. Note the small air-conditioning exhaust fans above are embarrassing enough. But industrial ones are fair game too. 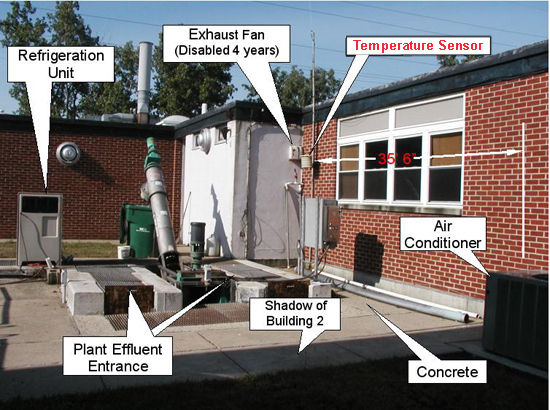 Could they put sensors near even bigger “exhaust fans” than industrial air conditioners? Yes. They found the largest industrial exhaust fans in the world. Seriously, who would put a sensor which gets periodically blasted with hot air from machines that generate anything up to 100,000 horsepower of thrust? Not to mention the two square kilometers of tarmac that absorbs heat 12 hours a day. Is there any chance that a thermometer so close to all that asphalt or concrete would record the same temperature as one in a field of cows? 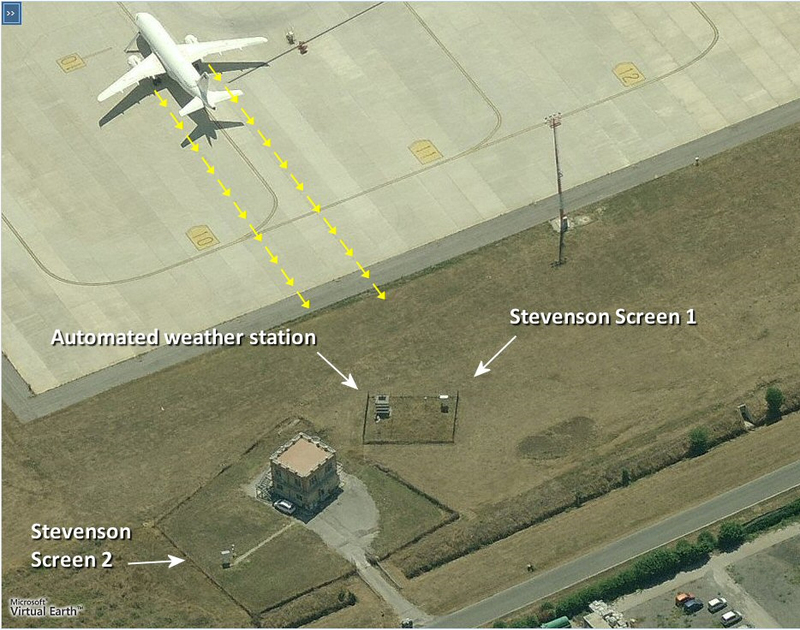 I imagine that airport site is not maintained by NOAA, since it’s in Italy. But the point is very important. Of the four global temperature sets, GISS relies heavily on airports, and frequently reports higher average temperatures than the satellites do. Airports contribute 554 of the 1079 readings used to come up with “global temperatures”, and 121 of the 134 used in the US. There are thousands of other sites around the world that NOAA get data from that they don’t use. So 50% of the global surface statistics come from sites close to giant heat sinks. Shouldn’t we have sites on farms nearby to compare the difference? 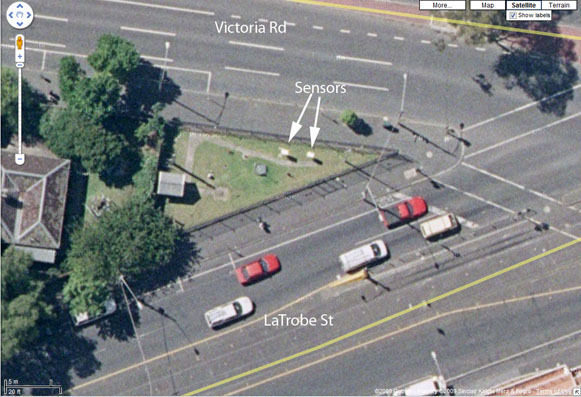 In Melbourne, Australia, one historic temperature collection point is on the corner of LaTrobe St. and Victoria Rd., sandwiched between nine lanes of traffic and a tram line. This is one of the busiest streets in Australia. These thermometers have been at the same spot since before the Ford Model T was invented. How could recorded temperatures not rise under these circumstances? 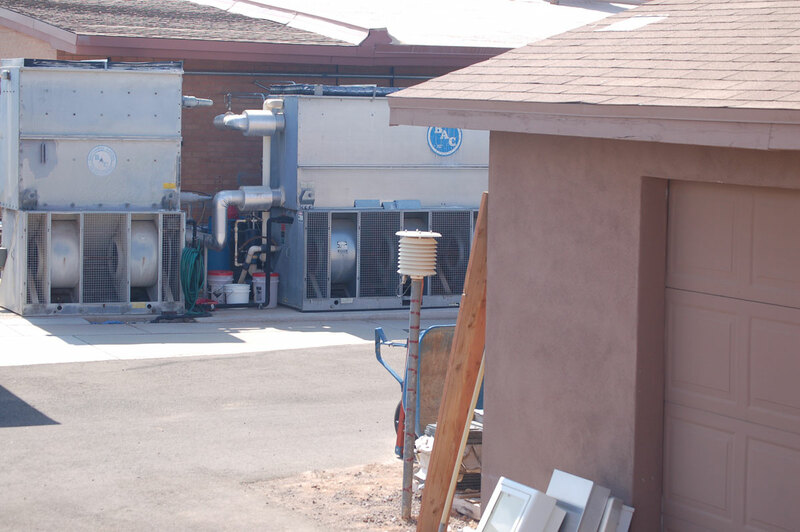 We can’t trust thermometers in places now surrounded by engines, concrete, and air conditioners. Source: For hundreds of other examples like this see SurfaceStations.org. Thanks to Anthony Watts for collecting an army of volunteers together to take these photos and giving permission to use them. I put more photos here than I could fit in the Handbook. The number of shots with rampant breaches of the standards is extraordinary. These are hardly cherry picked. Watt’s survey of over 1000 stations shows that about 89% of them breach NOAA’s standards. That’s right, one out of ten sensors is sited correctly. Bureaucratic ineptitude knows no bounds. I’d like to satirize the placement of sensors, but since they put finely calibrated equipment next to reverse cycle heaters, and Boeing turbines, I mean, really, what can I say? This graph shows how the recordings from satelites have not risen as fast as the recordings from the surface sensors. Since 1979 there have been millions cars, car-parks, air conditioners, extensions to runways and extra flights. 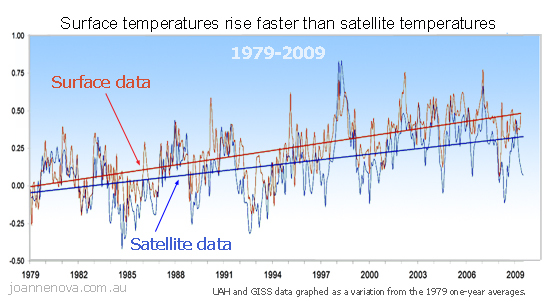 At least some of the recorded “global warming” shown only from surface sensors is due to the Urban Heat Island effect. Anthony Watts is a retired meteorologist who noticed the problem, and organized the volunteers, and site surveys. NOAA has responded to his study, curiously initially without mentioning his name. That was corrected about a month later. Discussing work by “he-who-we-shall-not-name” was more like a Harry Potter plot than an official government document. NOAA’s main rebuttal is that if you compare rural to urban stations there is very little difference. Anthony replies that the way they define rural and urban stations means that there are good and bad stations in both sets. After all, even in a small town, if the sensor is in the carpark, it’s still not reading the same temperature it would if it were over grass. They’re not comparing apples and oranges, they’re comparing two bowls of fruit salad and finding (surprise) that they are quite similar. Well, they would be wouldn’t they? You can support Anthony with donations at his site Watts Up With That. Like many skeptical scientists he has worked pro bono, in this case to expose failings in an organization that gets $4 billion dollars a year. See my article here on grassroots unpaid workers fighting giant bureaucracies. They could use your support. 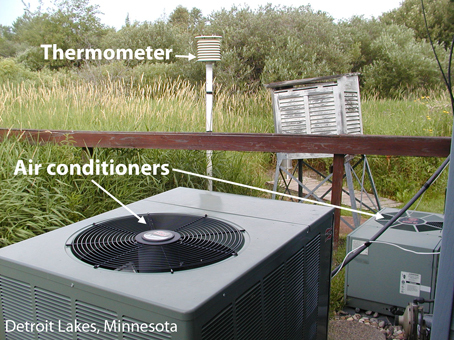 As usual, the glaring question is why newspapers won’t print photos of temperature sensors like these? How much respect would the public have for the worlds hallowed climate science experts when none of the Unskeptical scientists who claim concern for the climate has expressed any concern for the data they base their decision on? Where are the press releases from Michael Mann, James Hanson, Schnieder, and others calling for NOAA to lift it’s standards? You can be sure it would be front page news if trees had grown up to shade the surface thermometers and they were under-reporting the temperatures. The bias in the media and the bias of researchers is loudly announced with the silence. NCDC “talking points” (about he who was not be named). Watts reply to the NCDC. NOAA – National Oceanic and Atmospheric Administration.